Alright, tomorrow I will probably talk a ton about film school again, but today I'm going to go back to fiber talk. 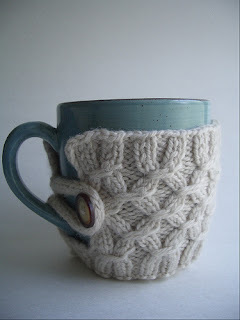 So this pattern is not obscure, but it's so darn cute and simple that it has everything I love in a houseware pattern. 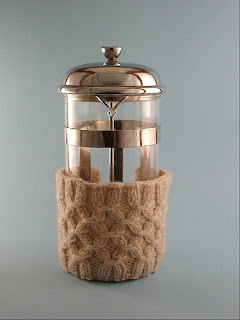 MK Carroll's Mug and French Press Jacket is so simple in concept, but can make a huge difference in the look of a coffee cup. 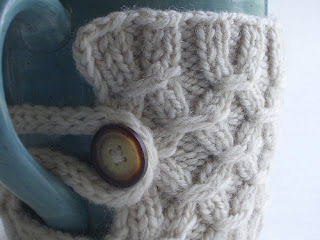 I love how the stitch pattern doesn't resort to the same old cables. Even the closure is so intentional. Look at the button choice with yarn choice. Great pairing! The pattern looks great in all kinds of colors and a variety of objects. It'd even look great in a handpainted yarn! The best part: the pattern is free. 100%, absolutely free. 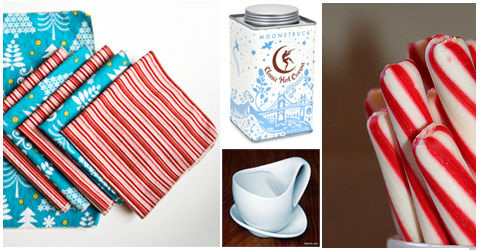 Think about serving a guest some hot cider this fall, wrapped in a little sweater! Extra cozy! It adds color to your coffee, and would be so cute on an office mug. I have TONS of free mugs from vendors, and this would be awesome for obscuring logos, if needed. How cute would it be to pair four of them with some cute cocoa mix, some nice cups, peppermint sticks, and a few wintery napkins? LOVE. The pattern is scalable, clearly written, and apparently popular: there are currently over 600 FO's on Ravelry, and they are all totally different and interesting. 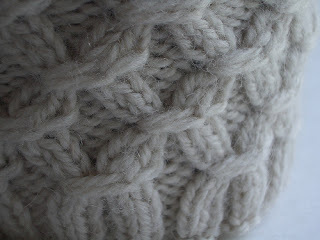 With 90-160 yards of yarn needed for the project, (worsted), it is a great scrap project, too! I've always loved that pattern. But have I ever actually bucked up and knit it?? Nope! Might need to make sone for stocking drifters this year. I know what you mean! Some pattern sit in my queue because I just KNOW they'll be great quick gifts!